I'm so sorry for my long break. Today I'm in Shijou-Karasuma in Kyoto. The sky is so blue! Today is Gion-Matsuri in Kyoto. 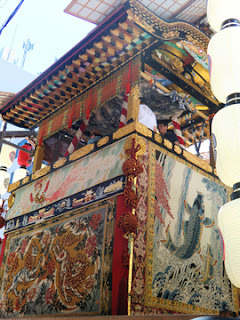 This is "Yamaboko",the parade float. when epidemic disease spread throughout Kyoto. So people offer a prayer to the God to drive away bad spirit. 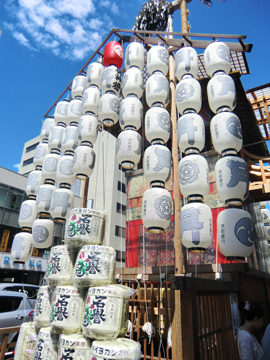 That is said to be the origin of Gion Matsuri. 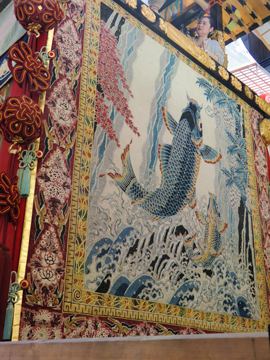 This is "Rising Carp",by Gekka Minagawa (famous kimono dyer). It was so damaged because of oldness that it was renewed 7 years ago. This tapestry is "Chinese Lion,Kirin(mythical animal in China)". This is "Flying Crane and The Sun". 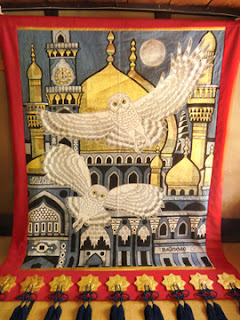 This was made by Taizo Minagawa(famous kimono dyer) in 1982. Seeing these gorgeous tapestries is one of my favorite things. They are really worth seeing! Yeah,these parade floats and tapestries are really powerful. If you enjoy these pics,I'm happy! Hi, Kumiko! I don't know why my comments does not appear, I left it 2 days before. 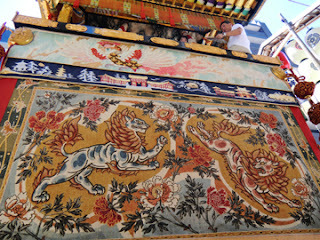 I am sorry that I had not the luck to assist to a festival when I was there. Are those really cranes? I think they are owls! Yeah,if only I could have shown you this festival this year!! This is really powerful and dynamic festival. You're right.I added another pic.Please look at the 5th pic. 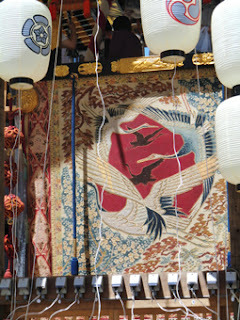 This is tapestry of cranes.And the last pic is owls. My explanation was not correct.I'm really sorry. The tapestries are really nice.